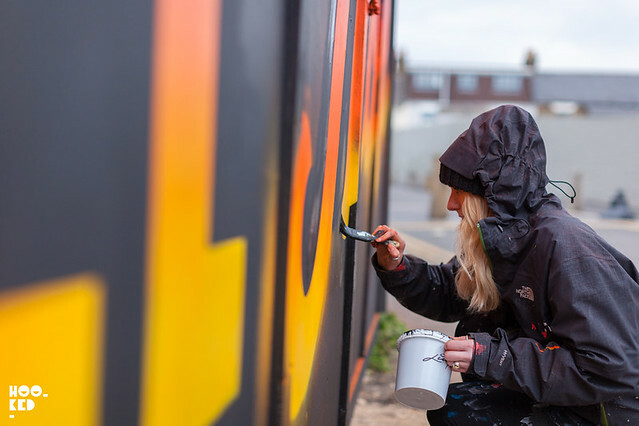 Hookedblog have been back and forth to Walthamstow, London the last few days checking in on the the progress of the first Paint Your London event launched last weekend by local art based collective Wood Street Walls (Previously on Hookedblog). Paint Your London is a local street art festival which is also part of the Mayor of London’s 11 day festival “Find Your London”, which celebrates London’s outdoor spaces. 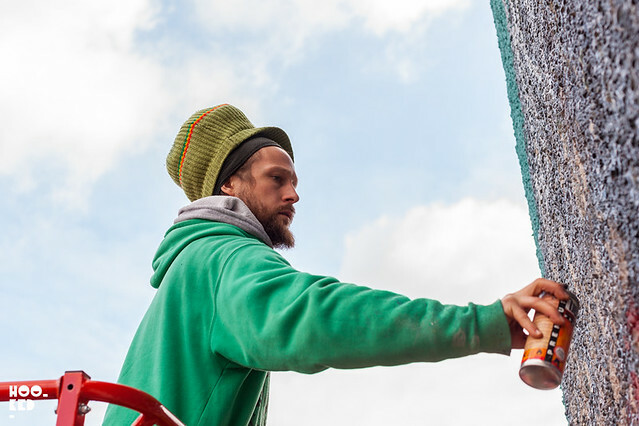 The collective are giving the Waltham Forest neighbourhood a fresh lick of paint throughout their month long event that will see them transform bland and dreary buildings across Walthamstow, Leytonstone, Leyton & Chingford into colourful works of art. They are achieving this with the help of some of the best local and international street artists, 20 in total who they have enlisted to help transform multiple locations over the duration of the event. Vibrant typographic mural in progress from artist and designer I am Lilly Lou which is located on West Avenue Bridge, E17 9QN. 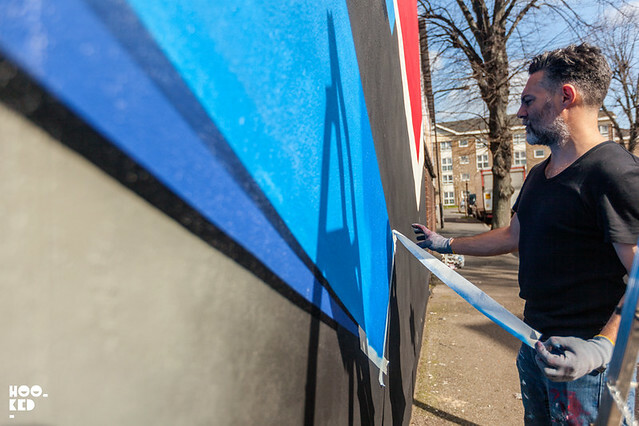 Remi Rough working on his large scale mural located on just off Wood Street on the corner of Brandon Road. Frankie Strand putting the finishing touches to her Wood Street mural which she has now completed, just off Wood Street on Cuthbert Road. Street Artist Louis Masai going large with his mural on a gable end wall of a terrace house on Lancaster Road where he has painted an endangered Red-shanked doc monkey in collaboration with the Body Shop. Masai spend three days working on his mural which was completed on Monday 21st March. You can check out the finished mural in person or have a look at our coverage on the blog of the completed Masai work here. 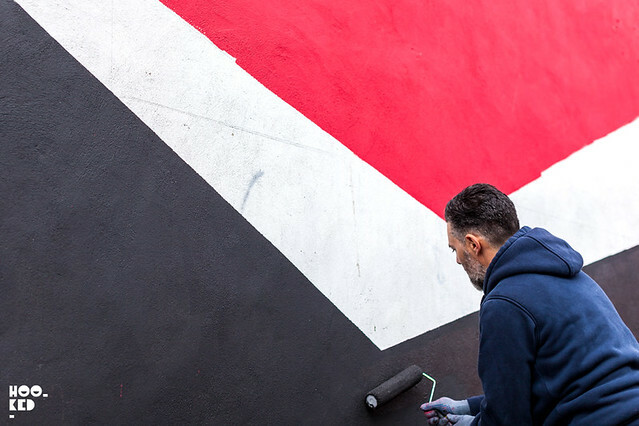 We caught up with Artist / Designer and E17 resident Mark McClure on Tuesday 22nd March, putting the finishing touches to his mural located on the side of Forest Pharmacy, 615 Forest Rd, London E17 4PP. You can see the schedule on the Paint Your London website. 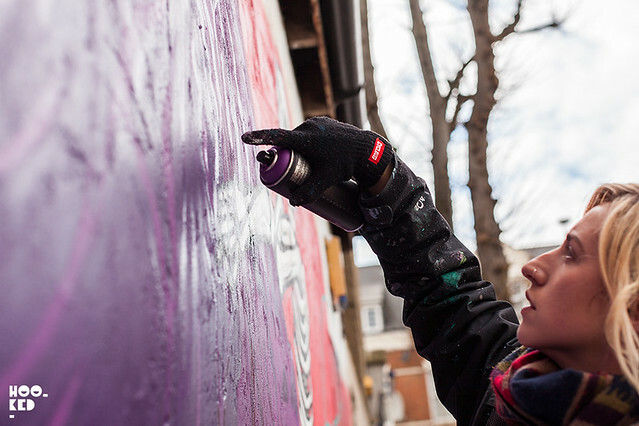 With close to 20 artists taking part in the event some have already completed work on their murals since our last visit to the area, stay tuned as we will be bringing you coverage of all the finished works from the event soon. 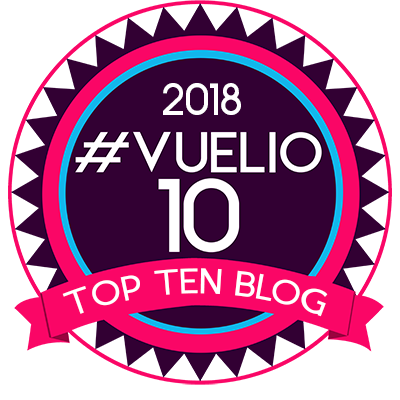 If you want to watch some of these works in progress for yourself there are still plenty of oppertunities to do so. 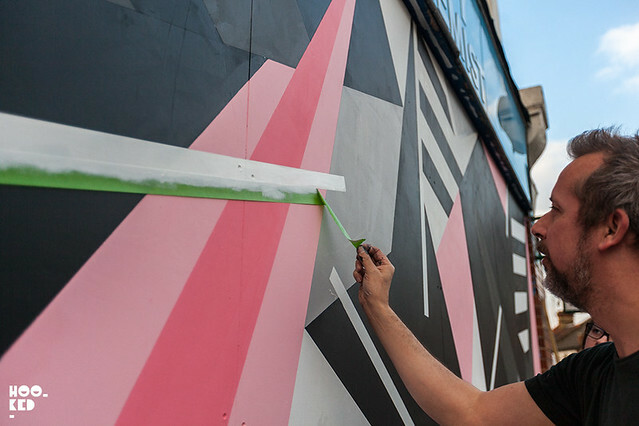 Other street artists taking part in Paint your London and set to paint over the coming month include world renowned Irish street artist Maser (Previously on Hookedblog), who will be using the disused music venue The Standard on Blackhorse Road as his canvas, wallpapering the entire building on 11th April. Street art / grafitti legend and Walthamstow resident Shok-1 (Previously on Hookedblog) will be painting at The Bell Pub on Forest Road, E17. What with busy schedules some artists have yet to confirm dates they are free so keep an eye on the Paint Your London schedule for updates.